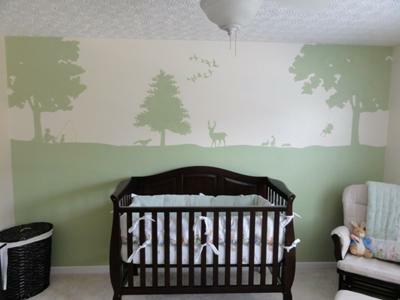 There are many baby nursery themes where deer bedding is a good choice as well as different approaches that we can take to decorating these themes. There is the enchanted forest animal theme with Thumper, Bambi and friends and then there are nursery bedding sets that highlight woodland creatures such as the whitetail deer in a more natural way. The pictures of various decorated nurseries found in our photo gallery will help you to see several options. The deer in the Bambi theme bedding sets would be depicted in the classic, doe eyed cartoon style and the forest theme would feature whitetail deer as they appear in nature. The latter would appeal to decorators that are in the process of designing a hunting theme nursery or a parent who prefers their forest animals without any embellishments even in a baby’s bedroom. 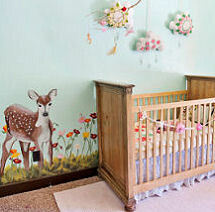 Go here to see more deer baby bedding sets and nursery decorations for your decorating project. Bambi and friends would be excellent in a Disney room theme or in any space where the desired atmosphere is restful and serene. The decorations might be Bambi collectibles or lots of stuffed toys that are famous forest creatures from the movie. This is the ideal style of deer bedding for a child whose parents would never dream of hunting Bambi for any reason other than to take a picture. 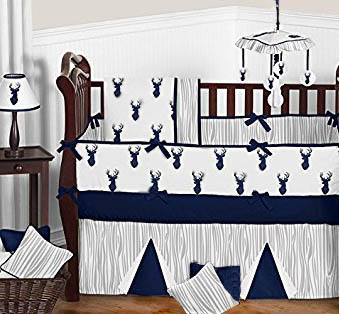 Hunters and fisherman with a log cabin need rustic baby crib bedding sets with black bears, moose or white tail deer bedding sets for baby boys rustic, hunting nursery themes. Any of the fabric prints listed above, including camouflage baby bedding, would be cute, depending on what your taste in forest baby nursery decor happens to be. For instance, some wilderness buffs prefer to decorate with their favorite fish over the furry creatures of the forest. 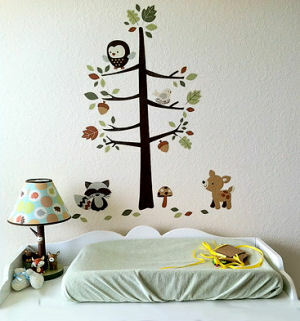 Decorate the nursery wall with a collection of vinyl wall stickers featuring deer and their forest friends or paint your choice of animals surrounded by nature. The soft, subdued brown and green baby nursery color scheme of the bedding with whitetail deer and the forest motifs will blend perfectly with the style of decor in a hunting lodge or log home. Don't forget to include our feathered friends. 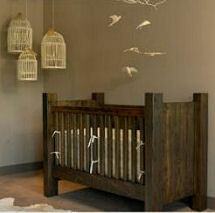 The realistic look works well for a nursery in a home where hunting is a favorite pastime or hobby. It would look pretty silly to have Bambi themed crib bedding in a nursery where deer heads are the main nursery wall decorations. Hunting trophies can be very attractive surrounded by a collection of forest animals in a baby boy's nursery. Hunting theme baby bedding would look fantastic displayed in a rough hewn, handmade log baby crib with a deer baby crib mobile to entertain the budding baby hunter. 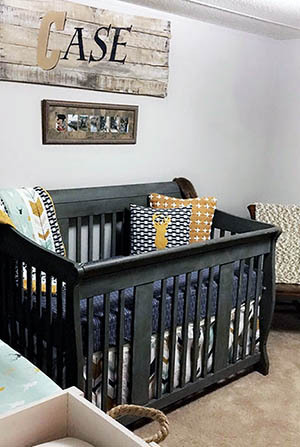 Add a vintage patchwork baby quilt, decorate the floors with a faux deerskin fur rug and your hunting theme nursery should last until the kids are grown. 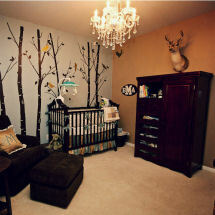 Rich, fall colors of navy blue, gold and brown make this baby boy's deer nursery theme warm and inviting. Please make plans to visit Unique Baby Gear ideas again soon to see the latest forest and baby deer nursery ideas with tips on how to accessorize and decorate a rustic, hunting theme nursery for a baby boy or girl.